Fort Duquesne (originally called Fort Du Quesne) was the most important of the French posts built in the Ohio Country, Fort Duquesne commanded "the Forks" (modern Pittsburgh), where the Allegheny and Monongahela Rivers meet to form the Ohio. It was named for Ange de Menneville, marquis de Duquesne, the Governor-General of New France from 1752 to 1755. A PARTY of Captain Trent's men had gone to the Ohio, and begun to build a fort. Just before Colonel Washington reached Will's Creek, a rumor came from the interior that these men were taken by the French; and two days afterwards the alarming intelligence was confirmed by the ensign of Captain Trent's company. He reported that, while they were at work, forty-one in number, a body of French troops descended the river from Venango, consisting of one thousand men, with eighteen pieces of cannon, sixty bateaux, and three hundred canoes, under the command of Captain Contrecoeur, and summoned them to surrender, threatening to take forcible possession of the fort if this summons were not immediately obeyed. No alternative remained, and, the captain and lieutenant being absent, Ensign Ward acceded to articles of capitulation, and gave up the fort, but was permitted to retire with his men. He came to Will's Creek, and brought the news of the disaster. His statement, however, as to the numbers of the French, their cannon and boats, turned out to be very much exaggerated. This was the first open act of hostility in the memorable war of seven years that followed. The French enlarged and completed the fort, which they called Fort Duquesne, in compliment to the governor of Canada. The position of Colonel Washington was now a somewhat critical one. His small force of ill-disciplined recruits might easily be surrounded and cut off. But he determined to advance, to construct a road as he did so, and, if he could reach the Monongahela, to build a fort at the mouth of Redstone Creek. The progress was a slow one. Great difficulties had to be overcome, and provisions grew scarce. Washington attempted to find a passage by water down the Youghiogheny, but failed, from obstructions in the river. On his return he received word from the Half-King, a friendly sachem, that a party of French were marching towards him, determined to attack the first English they should meet. Not knowing their number, or at what moment they might approach, he hastened to a place called the Great Meadows, cleared away the bushes, threw up an entrenchment, and prepared, as he expressed it, "a charming field for an encounter." He then mounted some of the soldiers on wagon-horses, and sent them out to reconnoiter. They came back without having seen any traces of the enemy; but the camp was alarmed in the night, the sentries fired, and all hands were kept under arms till morning. Mr. Gist came to the camp, also, and reported that a French detachment, consisting of fifty men, had been at his settlement the day before, and that he had observed their tracks within five miles of the Great Meadows. The approach of the French with hostile designs was now deemed certain; and the best preparation was made to receive them which circumstances would permit. In the mean time, about nine o'clock at night, another express came from the Half-King, who was then with a party of his warriors about six miles from the camp, stating that he had seen the tracks of two Frenchmen, and that the whole detachment was near that place. Colonel Washington immediately put himself at the head of forty men, leaving the rest to guard the camp, and set off to join the Half-King. The night was dark, the rain fell in torrents, the paths through the woods were narrow and intricate, and the soldiers often lost their way, groping in the bushes, and clambering over rocks and fallen trees. The whole night was spent in the march, and they got to the Indian encampment just before sunrise. A council was held with Tanacharison [the Half-King] and his chief warriors, and it was agreed that they should march in concert against the French. Two Indians went out to ascertain the position of the enemy, which was discovered to be in an obscure retreat, surrounded by rocks, half a mile from the road. The plan of attack was then formed. Colonel Washington and his men were to advance on the right, and the Indians on the left. The march was pursued in single file, according to the Indian manner, till they came so near as to be discovered by the French, who instantly seized their arms and put themselves in an attitude of defense. At this moment the firing commenced on both sides. A smart skirmish ensued, which was kept up for a quarter of an hour, when the French ceased to resist. M. de Jumonville, the commander of the French party, and ten of his men, were killed. Twenty-two were taken prisoners, one of whom was wounded. A Canadian made his escape during the action. One of Colonel Washington's men was killed, and two or three wounded. No harm happened to the Indians, as the enemy's fire was directed chiefly against the English. This event occurred on the 28th of May. The prisoners were conducted to the Great Meadows, and thence, under a guard, to Governor Dinwiddie. This action, the opening conflict of arms in the war, acquired a notoriety far beyond its importance. When the news of the event reached Paris it was greatly misrepresented. Jumonville was considered a messenger bearing a civil summons, who had been waylaid and assassinated; and an able French poet, named Thomas, made it the foundation of an epic poem entitled "Jumonville," and his fiction has become to some extent the fact of modern French historians. Jumonville did bear a summons, but it was an order for the English to retire, with a threat of compulsion if they failed to obey. This summons he did not show, but approached the English camp stealthily, and brought on himself, by his imprudence, the fate which he experienced. Some reinforcements soon after reached Virginia, consisting of three hundred and fifty men from North Carolina, one hundred from South Carolina, and two companies from New York. Of these only those from South Carolina arrived at Great Meadows. It was foreseen by Colonel Washington that when the French at Fort Duquesne should get the news of Jumonville's defeat a strong detachment would be sent out against him. As a preparation for this event, he set all his men at work to enlarge the entrenchment at the Great Meadows, and to erect palisades. To the structure thus hastily thrown up he gave the name of Fort Necessity. The Indians, who leaned to the English interest, fled before the French and flocked to the camp, bringing along their wives and children and putting them under his protection. Among them came Tanacharison and his people, Queen Aliquippa and her son, and other persons of distinction, till between forty and fifty families gathered around him and laid his magazine of supplies under a heavy contribution. It may be said, once for all, that the burden of supporting these sons of the forest during this campaign, and the perplexities of managing them, were by no means counterbalanced by any advantage derived from their aid. As spies and scouts they were of some service; in the field they did nothing. The forces at the Great Meadows, including Captain Mackay's [South Carolina] company, had now increased to about four hundred men. But a new difficulty arose, which threatened disagreeable consequences. Captain Mackay had a royal commission, which in his opinion put him above the authority of Colonel Washington, who was a colonial officer, commissioned by the governor of Virginia. He was a man of mild and gentlemanly manners, and no personal difference interrupted the harmony between them; but still he declined receiving the orders of the colonel, and his company occupied a separate encampment. .
To avoid altercation, and prevent the contagious example of disobedience from infecting the troops, Colonel Washington resolved to advance with a large part of his army, and, if not obstructed by the enemy, to go on by the shortest route to the Monongahela River. Captain Mackay's company was left at Fort Necessity, as a guard to that post. The road was to be cleared and leveled for artillery-carriages; and the process was so laborious that it took two weeks to effect a passage through the gorge of the mountains to Gist's settlement, a distance of only thirteen miles . . Due vigilance was practiced, and scouts were kept abroad, even as far as the neighborhood of Fort Duquesne, so that the first motions of the enemy might be detected. It was soon discovered that Fort Duquesne had been reinforced from Canada, and that a force was preparing to march against the English. It was at first decided to make a stand at Gist's settlement, and Mackay's company was ordered up. But another council decided that the enemy's force was too large, and that a retreat was necessary. It was achieved with great difficulty and exertion, the horses being few and weak, and the burden of labor falling on the men. In two days they all got back to the Great Meadows. It was not the intention at first to halt at this place, but the men had become so much fatigued from great labor and a deficiency of provisions that they could draw the swivels no farther, nor carry the baggage on their backs. They had been eight days without bread, and at the Great Meadows they found only a few bags of flour. . Colonel Washington set his men to felling trees, and carrying logs to the fort, with a view to raise a breastwork and enlarge and strengthen the fortification in the best manner that circumstances would permit. The space of ground called the Great Meadows is a level bottom, through which passes a small creek, and is surrounded by hills of a moderate and gradual ascent. This bottom, or glade, is entirely level, covered with long grass and bushes, and varies in width. At the point where the fort stood, it is about two hundred and fifty yards wide, from the base of one hill to that of the opposite. 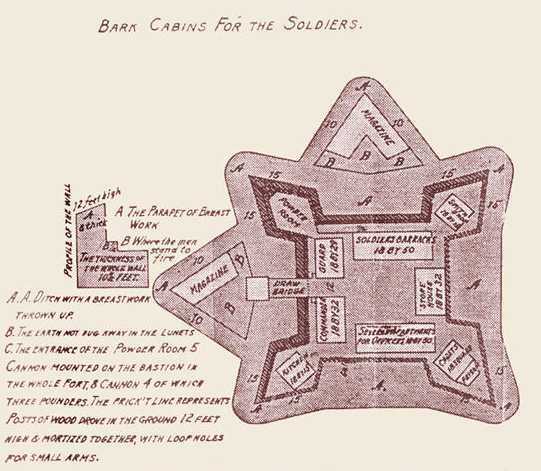 The position of the fort was well chosen, being about one hundred yards from the upland, or wooded ground, on the one side, and one hundred and fifty on the other, and so situated on the margin of the creek as to afford an easy access to water. .
On the 3d of July, early in the morning, an alarm was received from a sentinel, who had been wounded by the enemy; and at nine o'clock intelligence came that the whole body of the enemy, amounting, as was reported, to nine hundred men, was only four miles off. At eleven o'clock they approached the fort, and began to fire, at the distance of six hundred yards, but without effect. Colonel Washington had drawn up his men on the open and level ground outside of the trenches, waiting for the attack, which he presumed would be made as soon as the enemy's forces emerged from the woods; and he ordered his men to reserve their fire till they should be near enough to do execution. . He maintained his post till he found the French did not incline to leave the woods and attack the fort by an assault, as he supposed they would, considering their superiority of numbers. He then drew his men back within the trenches, and gave them orders to fire according to their discretion, as suitable opportunities might present themselves. The French and Indians remained on the side of the rising ground which was nearest to the fort, and, sheltered by the trees, kept up a brisk fire of musketry, but never appeared in the open plain below. The rain fell heavily through the day, the trenches were filled with water, and many of the arms of Colonel Washington's men were out of order and used with difficulty. In this way the battle continued from eleven in the morning till eight at night, when the French called and requested a parley. Suspecting this to be a feint to procure the admission of an officer into the fort, that he might discover their condition, Colonel Washington at first declined to listen to the proposal. He afterwards agreed to it, and, articles of capitulation being proposed by the French commander, they were accepted and signed by both parties. By the terms of the capitulation, the whole garrison was to retire, and return without molestation to the inhabited parts of the country; and the French commander promised that no embarrassment should be interposed, either by his won men or the savages. The English were to take away everything in their possession, except their artillery, and to march out of the fort the next morning with the honors of war, their drums beating and colors flying. As the French had killed all the horses and cattle, Colonel Washington had no means of transporting his heavy baggage and stores; and it was conceded to him that his men might conceal their effects, and that a guard might be left to protect them, till horses could be sent up to take them away. 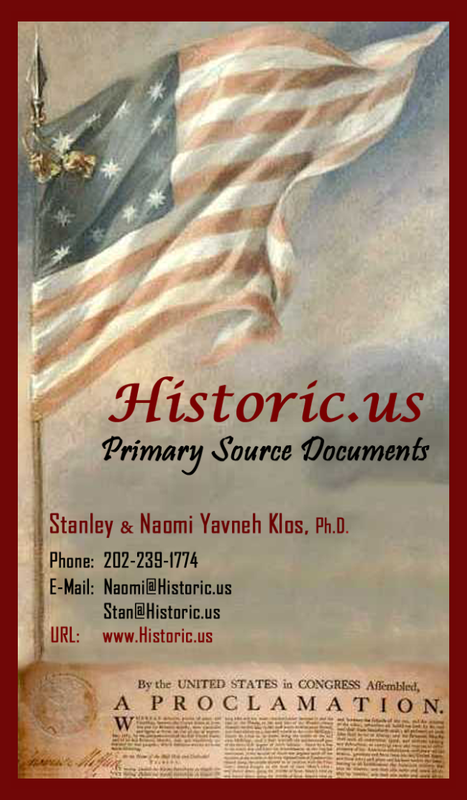 Colonel Washington agreed to restore the prisoners who had been taken at the skirmish with Jumonville; and, as a surety for this article, two hostages, Captain Vanbraam and Captain Stobo, were delivered up to the French, and were to be retained till the prisoners should return. It was, moreover, agreed that the party capitulating should not attempt to build any more establishments at that place, or beyond the mountains, for the space of a year. Early the next morning Colonel Washington began to march from the fort in good order, but he had proceeded only a short distance when a body of one hundred Indians, being a reinforcement to the French, came upon him, and could hardly be restrained from attacking his men. They pilfered the baggage, and did other mischief. He marched forward, however, with as much speed as possible in the weakened and encumbered condition of his army, there being no other mode of conveying the wounded men and the baggage than on the soldiers' backs. As the provisions were nearly exhausted, no time was to be lost; and, leaving much of the baggage behind, he hastened to Will's Creek, where all the necessary supplies were in store. Thence Colonel Washington and Captain Mackay proceeded to Williamsburg, and communicated in person to Governor Dinwiddie the events of the campaign.